A woman sorts raw frankincense gum in Burao. Prices for raw frankincense have gone from $1 a kilogram to $5-$7. 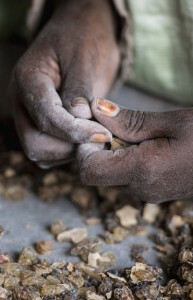 A woman sorts raw frankincense gum in Burao, a breakaway region of Somalia. Prices for raw frankincense have gone from $1 a kilogram to $5 to $7.